Why did Nintendo just spend five hours showing us what could be shown in five minutes? Let me make something clear right off the bat. I love The Legend of Zelda, and I couldn't be more excited about its new Wii U entry, Breath of the Wild. It looks like a solid addition to the series which balances maintaining its traditional feel while bringing in some significant, and welcome, changes. 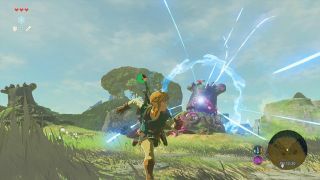 But in order to take in the new Zelda in its entirety, Nintendo expected people to sit and watch a dedicated stream of the game which went on for a mammoth five hours. Nintendo's intention with the move appears to have been to give people as much information and gameplay as possible directly from them rather than having to rely on journalists playing its games and then reporting this fuller information to their own audiences. In comparison, Sony showed off just a five minute trailer of Resident Evil 7 at its press conference and then had to rely on journalists playing the game on the show floor to deliver more in-depth impressions. This way Nintendo can deliver more coverage directly to its fans. There are undoubtedly advantages to this kind of E3 showing, but it's hard not to miss the traditional press conference with its ability to introduce you to new games that you would never bother to watch a live stream of. Press conferences are also great at condensing a game's headline features into a short five minutes. The new God of War? Kratos has a son and it looks like a much more cinematic game. FIFA 17? There's a story mode and dynamic weather. But sit me down and ask me what the headline feature is of the new Legend of Zelda and I'd be hard pushed to tell you. I know from watching the livestream that you can gather fruit and cook them together into potions. I know that Link can jump and climb and cut down trees. What I don't know is what the most important new features in the new game are. I don't know whether cutting down trees is a crucial mechanic, because it was a feature that was discussed for five minutes in a livestream that lasted five hours. Most importantly I don't know how these mechanics fit together. I saw Link cut down a tree to make firewood, but then I had to wait half an hour to actually see him turn that same firewood into a campfire and make use of it. If Nintendo had needed to fit its demonstration into a press conference we would have seen a much more condensed mini-story. Link would have cut down the tree and immediately set to work building a campfire to show off the potion alchemy on. It's these smaller stories of how mechanics fit together that you miss when the presentation is as long as Nintendo's was this year. You don't get these end to end stories of a game's features, they're just too spread out. Again, I can absolutely see the advantages of the massive live stream. If you want to learn literally everything there is to know about the new Zelda then Nintendo has been great at providing a one-stop shop for all the information you could possibly need. But there's value in editing information down, value in limiting your message to the top things people need to know. Press conferences force companies to do just that, they force them to pick their biggest games and show their highlights. And I'm sad to see Nintendo leave that kind of E3 behind them.